The Only Way is Essex star Pete Wicks poses trapped and bloody in a series of striking photos and videos by renowned photographer Trevor Leighton to support animal charity Humane Society International UK’s Fur-Free Britain campaign. An estimated more than 100 million animals are killed every year for the fur trade. Most endure a life of deprivation and suffering on fur farms where they spend their lives in small, barren, wire cages. Other animals like coyotes are trapped in the wild. Once caught, these animals can languish in agony in cruel traps for hours or even days before being shot and killed when the trapper returns. Animals have been known to die from dehydration, starvation or attacks by predators, or even to gnaw off their own limb in an effort to escape. Brands like Canada Goose and Woolrich use fur from coyotes trapped in the wild as trim on hooded coats and jackets. In an exclusive video interview with HSI, as well as highlighting the cruelty of trapping and fur farming, Pete also spoke in favour of banning the sale of all animal fur in the UK. Last month HSI UK Executive Director Claire Bass spent 24 hours in a cage outside the Department of Environment Food and Rural Affairs to protest against fur following a recent visit to fur farms in Finland that left her shocked and appalled. 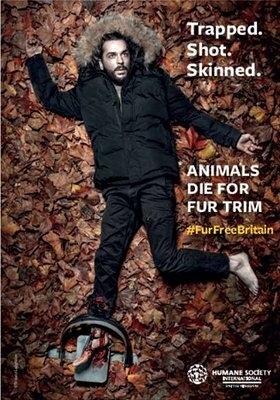 Pete Wicks is the latest celebrity to lend support to HSI UK’s #FurFreeBritain campaign calling for a UK fur sales ban. Paloma Faith, Fearne Cotton, Alesha Dixon, Evanna Lynch, Kirsty Gallagher and Nicole Appleton have all posed in #FurFreeBritain t-shirts urging their fans to sign HSI’s petition at hsi.org/banfur and a host of stars including Dame Judi Dench, Andy Murray, Stella McCartney, Ricky Gervais and Simon Pegg signed a letter to Prime Minister May calling for action. Cross party MPs including John McDonnell, Zac Goldsmith, Maria Eagle and Tom Brake also support a fur ban, and opinion polls suggest that the majority of the British public is also in agreement, with 80 per cent believing that it’s unacceptable to buy or sell animal fur in the UK, regardless of species. Fur sales bans have been put into law in major US cities San Francisco and West Hollywood, and Los Angeles is set to follow suit. In January 2017 India adopted an import ban on mink, fox and chinchilla fur skins and in 2015 Sao Paolo adopted an import and sales ban on fur products. Yesterday global fashion giant Chanel announced that it is going fur free.